Millennials get a bad rap in the business community as having a tough time communicating by phone and in person. 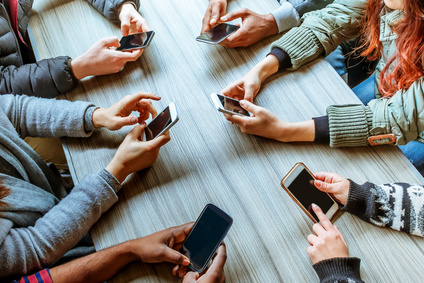 Growing up in the digital age has endowed the majority of this generation with impressive technical skills, and they tend to be early adopters of new technology as it’s rolled out, including up-to-the-moment social media and communication platforms. But when it comes time to speak in person or by phone to introduce themselves, interview, negotiate salary, advocate for themselves under pressure, or simply conduct business over the phone, there’s a consistent story of failure based on fear. Secondary schools in the U.S., Canada, and the U.K. have been addressing this issue in the classroom, as they hear from university recruiters, professors, and even CEO’s that students and new hires have been struggling with communication skills for the past 15 years. Universities are also trying to bridge the skills gap with changes in curriculum and new classes to help students prepare to communicate comfortably and confidently both during and after college. These soft skills deficits can be hidden behind technical expertise and a great education for a short while, as they can be chalked up to a new graduate’s nervousness. Those deficits will become more obvious as you rise through the ranks because these are the skills you use to network, interview, negotiate salary, resolve questions and issues, and interact with team members and supervisors. Your technical skills and education can catch the interest of hiring influencers, but most employers simply don’t have the time or the patience to teach communication skills or work around a fear of picking up the phone or speaking confidently in person. Forbes and other business media offer harsh views of this generation’s fear of conflict and direct communication. LinkedIn articles bemoaning Millennials’ avoiding phone use abound, and there are even YouTube tutorials designed specifically to improve Millennial communication. You are not alone, many of your peers are having the same difficulties. The communications skills needed to introduce yourself, hold a conversation, negotiate, resolve conflict, and sell yourself or a product can be intimidating, but simply preparing and practicing at a comfortable pace in a private setting will relieve anxiety, build confidence, and allow you to grow those skills with less discomfort than trying to do it while coping with full-speed and possibly high-stakes on the job. Find a friend, parent, or a professional Career Coach who is comfortable with the communications skills you need to improve and use them both as a conversational partner and a sounding-board. Prepare. Decide what you need to work on most, and write a script for yourself, or at least some handwritten notes on the information you need to discuss. Do NOT make notes on your phone or tablet, as constantly glancing at your device can seem rude to your conversational partners. If setting up appointments gives you hives, make a list of the information you need or need to offer. Write out the phone number and the name of the person you intend to see. Do this preparation for each communication scenario you need to become comfortable with. Preparing ahead isn’t a technique just for Millennials or the inept, it’s great advice and something many effective communicators do to ensure they don’t miss important facts, topics, or to stay on track during a call or meeting. Practice. Once your script or list is filled out, have your coach or friend play the other roles and practice. You’ll notice the conversations are much easier if you have prepared ahead of time. Rehearsing an impending interaction you’re anxious about is something every effective communicator does. From rehearsing a speech, to practicing an elevator pitch, introduction, or salary negotiation, every business leader has rehearsed and polished their words for important interactions. It’s part of what makes them effective! Perform. Once you have prepared and practiced, it’s time to do the real thing. Pick up the phone and make a low-stakes appointment. Schedule a vet appointment or a haircut. Use the preparation and practice to cover all your bases. After you can do the low-stakes interactions with confidence, increase the stakes a bit and prepare and practice for a meeting with a superior, a recruiter call, or whatever you need to accomplish in the near future. Work your way up to the more stressful interactions, but as you gain confidence, those will become more comfortable, too. As these three steps become familiar and turn into a habit, you’ll become an effective, confident communicator who is able to interact socially and professionally on the phone and in person. This increase in your communication skills will have a direct and positive effect on your career. So, prepare, practice and perform!